If I understood correctly, inner hair cells generates a graded potential (receptor potential), this potential maps the stereocilia deflection. On the other hand, the cochlear nerve cells transmit action potentials to the brain. The question is how and where the graded potential is converted to action potentials. In particular, as action potential signals are characterized by the interval between triggers, how are the sound properties (power and frequency) mapped into this interval? Sound level is coded in spike rate, frequency is coded by a place-frequency map. Spiral ganglion cells (SGCs, the secondary sensory neurons making up the auditory nerve) are continuously firing cells in a healthy ear (they fall silent when the hair cells degenerate, leading to deafness). In fact, their base frequency in silence is pretty high. The only thing the hair cell input does is lowering, or elevating the threshold and hence affecting firing rate. During a sine wave stimulus (a pure tone), the stereocilia of the hair cells deflect in one phase, and inflect on the other. One phase hence depolarizes the SGC, the other hyperpolarizes it. This generates a near-perfect representation of the sine wave input at low frequencies. At high frequencies the SGCs may skip a phase or two, but because multiple SGCs are involved, the population code is still stochastically spot on. Sound level is coded in spike rate, frequency is coded by a place-frequency map (Müller, 1996). The base of the cochlea codes high frequencies, the apex low frequencies. Hence, loudness is coded by every SGC, while frequency determines which SGC is activated. 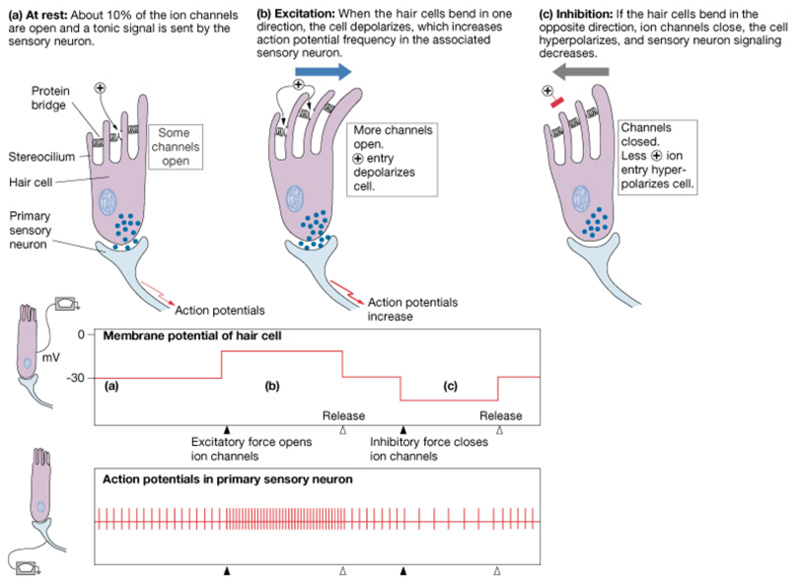 An informative overview of hair cell signalling is provided in Fig. 1. - Kandel et al., Principles of Neural Science, 4th ed. Hearing and neurons- do ears have a sampling period? How to make a fake auditory signal? Why does the “all-or-none” principle hold true for only single nerve cell, and not a bunch of nerve cells?